I don’t normally venture south, but the offerings of Camberwell are enough to coax me across the river. This leafy suburb in the South east is attracting young hipsters in their droves with its promise of (vaguely) affordable living and a good selection of restaurants, bars and clubs. This café has a friendly feel in line with the neighborhood around it. It’s quaintly decorated interior makes it a cozy place to catch up with friends or people watch. 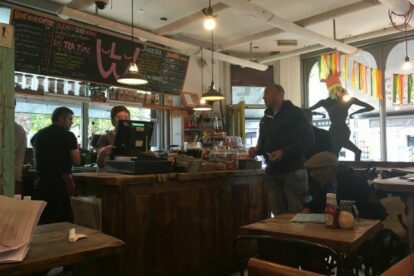 The food also attracts a crowd – I would recommend the high-quality English breakfasts (this is no greasy spoon), the ice-cream loaded milkshakes and cakes. At lunchtime, this place is brimming with staff from the nearby hospital, but outside of these times it makes a great place to get on with some work with a coffee or just to sit in the window and watch the people of Camberwell go about their business.